State Farm is nationally renowned for its commitment to customer service, community involvement and great financial strength. As one of the USA's most recognized insurance providers, there is much more to this company beneath the fold of public awareness. State Farm employs almost 70,000 people as customer service representatives alone. These operate the company care centers 24/7 all year round. Their claims department handles between 30,000 and 40,000 claims per day. State Farm is the largest insurer in the US, having been the #1 auto insurer since 1942, the #1 home insurer since 1964 and is currently the largest boat insurer nationally. It has the best record of retention rates for new agents and provides them with industry-leading company support. State Farm has almost 80 million policies in force in North America with nearly two million bank accounts. Agents will benefit from providing these popular policies. 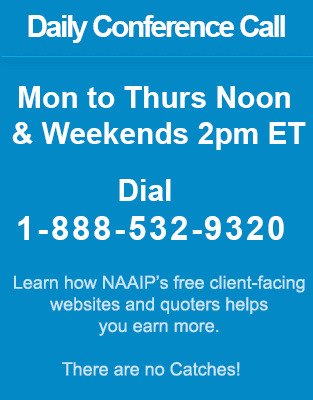 NAAIP will deliver excellent agent service and, of course, the extensive range of benefits that you expect from NAAIP including your free website, quote engines and marketing tools to help you sell these plans.